I don’t know when they became minibeasts. They were creepy crawlies when I was a child, then became insects or invertebrates if we wanted to be more accurate about it. But minibeasts is the term children are now taught and I like this as the catch-all term for everything from worms and snails through ladybirds and bees to spiders and centipedes. It gets you out of the messy business of having to count numbers of legs, but the term ‘mini-beast’ also makes me think of them of smaller versions of larger animals and puts me in mind of herds of woodlouse grazing dead logs like antelopes on the savannah or fierce ladybirds stalking their prey like lions, which is no bad thing. 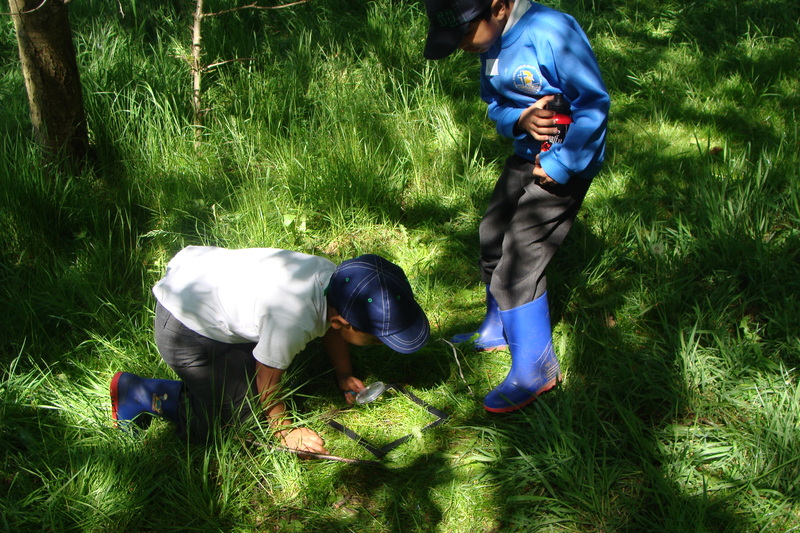 Minibeasts is now firmly on the primary curriculum so there’s lots of opportunities to incorporate minibeast hunting into an outdoor session. Equipping them with magnifying glasses, trowels and plastic pots and sending them off to dig holes, turn over rocks and peer under leaves, it is always fantastic to hear their delight at what they find. Adults coming across the Big 6 on a safari would not get as excited! Going on some mini beast hunts with some 4, 5 and 6 year olds recently I noticed how reactions split into 3 camps; the fearful who scream at anything that moves, the curious who want to pick it up and hold it and the bloodthirsty who want to kill it. The sequence usually goes something like this; Curious finds a beetle and manages to capture it in her hand, she shows her trophy to Fearful who screams and tries to run away, but then inches back to have another look. Bloodthirsty comes over to see what all the fuss is about. When the beetle drops from Curious’s hand onto the ground, Bloodthirsty stamps on it before it can escape. Curious is now furious and Fearful becomes tearful. The challenge for the adult is bring together these three perspectives to a position where we can learn about the animal and its habitat while still being respectful of it and its need to go about its business. Feeling afraid of tiny creatures and wanting to needlessly kill them can come from the same position; disgust. Adults naturally react badly to finding small creatures in the wrong place (e.g. in the house, in food or in their children’s hair!) so children pick up ideas about mini beasts being dirty pests. But in the great outdoors its us that are invading their space so its an opportunity to learn about their fascinating world and how each slimy slug, wriggly worm, scuttling spider and burrowing beetle has a critical part to play in the life of the woods. I’m not great at recognising all the different species so sometimes take a book or reference cards out to help with identification, but mainly I’m happy if our explorations just help children be more comfortable around minibeasts and caring for the world around them. Trouble is persuading some children to show a little less love and attention. Many are the worms and woodlouse we’ve had to rescue from being made a ‘nice house’ in an empty yogurt or carried home in a cardigan pocket full of fluff.